The State Policy Network (SPN) is a web of right-wing “think tanks” and tax-exempt organizations in 49 states, Puerto Rico, Washington, D.C., Canada, and the United Kingdom. As of October 2018, SPN's membership totals 158. Today's SPN is the tip of the spear of far-right, nationally funded policy agenda in the states that undergirds extremists in the Republican Party. SPN describes itself as a network and service organization for the "state-based free market think tank movement," and its stated mission is "to provide strategic assistance to independent research organizations devoted to discovering and developing market-oriented solutions to state and local public policy issues." It was founded in November 1991 and incorporated in March of 1992. Many SPN groups are and often write ALEC "model bills." In the states, SPN groups increasingly peddle cookie-cutter "studies" to back the cookie-cutter ALEC agenda, spinning that agenda as indigenous to the state and giving it the aura of academic legitimacy. Many SPN groups, such as the Mackinac Center in Michigan, have been accused of lobbying in their states, in violation of IRS rules for non-profit "charitable" organizations. The Kochs' Americans for Prosperity provides the "grassroots" boots on the ground for this agenda. Although many SPN groups claim to be independent and non-partisan, they promote a policy agenda -- including union-busting, attacks on the tort bar, and voter suppression -- that is highly-partisan and electoral in nature. SPN President Tracie Sharp told the Wall Street Journal that she had always felt Wisconsin and Michigan were only "thinly blue," and that the GOP has been put on better footing by the unions' slide. "When you chip away at one of the power sources that also does a lot of get-out-the-vote," she says, "I think that helps -- for sure." 1 Who Are SPN's Members? 3 Where Are SPN Groups Located? 4 When Was SPN Founded? SPN's membership includes state-based "think tanks," right-wing media institutions, advocacy groups, leadership training centers, and funding institutions like Donors Trust, an investment vehicle used by the Koch network of funders. Although SPN's "think tanks" often claim to be non-partisan, independent, and representative of the interests of their state, the groups receive funding from national foundations to pursue a national agenda often not supported by voters in those states. It is difficult to discern how much money is spent on SPN groups, as SPN and its affiliate groups are not required to disclose donors. SPN Executive Director Tracie Sharp told the Wall Street Journal in 2017 that the revenue of the combined groups was some $80 million. Tax documents and other available records reveal that SPN is funded by the same large corporations, right-wing foundations, and wealthy conservative ideologues that fund ALEC. Some of the most notable corporate funders of SPN and its web of "think tanks" include Big Tobacco companies (like Reynolds), Big Oil corporations (like the Koch family fortune), AT&T, Kraft Foods, Verizon, Comcast, Time Warner Cable, Facebook, and Microsoft. SPN and its "think tanks" are also largely funded by right-wing special interest groups and individuals, including the Koch brothers, the DeVos family, the Coors family, the Walton Family Foundation, the Roe Foundation, the Bradley Foundation, and Searle Freedom Trust. In response to a November 2013 report issued by the Center for Media and Democracy (CMD) -- "EXPOSED: The State Policy Network -- The Powerful Right-Wing Network Helping to Hijack State Politics and Government" -- SPN Executive Director Tracie Sharp told national and statehouse reporters that SPN affiliates are "fiercely independent." Later the same week, however, The New Yorker's Jane Mayer caught Sharp in a contradiction. In her article, "Is IKEA the New Model for the Conservative Movement?," the Pulitzer-nominated reporter revealed that, in a recent meeting behind closed doors with the heads of SPN affiliates around the country, Sharp "compared the organization's model to that of the giant global chain IKEA." She reportedly said that SPN "would provide 'the raw materials,' along with the 'services' needed to assemble the products. Rather than acting like passive customers who buy finished products, she wanted each state group to show the enterprise and creativity needed to assemble the parts in their home states. 'Pick what you need,' she said, 'and customize it for what works best for you.'" Not only that, but Sharp "also acknowledged privately to the members that the organization's often anonymous donors frequently shape the agenda. 'The grants are driven by donor intent,' she told the gathered think-tank heads. She added that, often, 'the donors have a very specific idea of what they want to happen.'" Where Are SPN Groups Located? Look at a state-by-state map here. SPN's predecessor, the Madison Group, was launched by ALEC in the 1980s, according to historical documents. 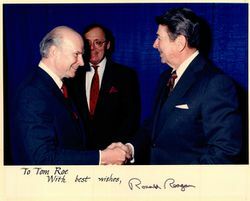 SPN was reportedly founded at the suggestion of President Ronald Reagan, who, in a conversation with millionaire Thomas Roe, suggested Roe create "something like a Heritage Foundation in each of the states." In the mid-1980s, Roe allegedly told fellow wealthy conservative donor and Heritage Foundation trustee Robert Krieble, "You capture the Soviet Union -- I'm going to capture the states." SPN as we know it today was formally created in 1992 as an "umbrella organization" to provide "advisory services" for its members. Learn more about SPN's founding in CMD's 2013 report, "EXPOSED: The State Policy Network -- The Powerful Right-Wing Network Helping to Hijack State Politics and Government." 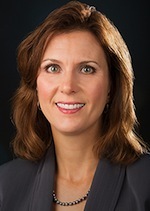 Tracie Sharp, president of SPN since January 2000, had previously served on its board of directors for 14 years. She was one of the founders and the executive director of Cascade Policy Institute, Oregon's SPN group, from 1991 to 1999. Sharp told the Wall Street Journal after Donald Trump's victory at the polls in 2016, "We feel like for such a time as this, we've built up this network. We need to really run. This is a state moment." Sharp celebrated Trump wins in traditionally blue, labor-friendly states like Wisconsin, Michigan and Indian, claiming that anti-union law changes pushed by SPN members and ALEC politicians in those states flipped them from blue to red between 2008 and 2016. Please see SPN Political Activity for more, including examples of SPN members' lobbying and political campaign contributions. The State Policy Network produced a "Messaging Guide: How to Talk About Teacher Strikes" as teacher strikes unfold to demand higher pay and more school funding in Oklahoma and Kentucky, following the statewide strike in West Virginia. "A message that focuses on teacher hours or summer vacations will sound tone-deaf when there are dozens of videos and social media posts going viral from teachers about their second jobs, teachers having to rely on food pantries, and classroom books that are falling apart, paper rationing, etc. This is an opportunity to sympathize with teachers, while still emphasizing that teacher strikes hurt kids. It is also not the right time to talk about school choice-that's off topic, and teachers at choice-schools are often paid less than district teachers." Many SPN groups focus on destroying unions -- most notably the Freedom Foundation in Washington State and the Mackinac Center for Public Policy in Michigan. As the [agenda] for SPN's 25th anniversary meeting in August 2017 shows, these two institutions provide training and leadership in this area for the entire SPN network. SPN's purpose, according to its by-laws, is to "assist in organizing, developing and raising funds for institutes throughout the United States whose purpose is the promotion of authoritative ideas and research studies on state and local public policy issues in the public interest." SPN's founding executive director, Lamm, is quoted in the Arkansas Democrat-Gazette as calling what think tanks in the network do "constructive troublemaking." Some of SPN's documented activities include "franchise" help -- setting up state think tanks and exchanging information; political candidate "training"; influencing state laws; litigating through associated litigation centers; creating PR plans; and hosting news sites criticized for conservative bias. Please see SPN Agenda for more. Bradley Foundation grants to SPN members in its right-wing network of groups stretch back many years and amount to approximately $133 million, according to Bradley's own grant summary documents tallied by the Center for Media and Democracy (CMD). "The Bradley Foundation files note that SPN’s recent focus has been on “catalyzing further efforts to curb public-sector unions’ excesses” and “mobilizing nonprofits, donors and citizens to uphold the principles of donor privacy and freedom of speech” (SPN, Grant Proposal Record, July 2016)," a report from CMD details. Through 2016, the State Policy Network received $360,000 from the Lynde and Harry Bradley Foundation. 2015: $50,000 to support general operations. 2014: $35,000 in support of its state based strategy to advance free enterprise. While it has become an $83 million dollar right-wing empire, SPN and most of its affiliates do not post their major donors on their websites. But public documents discovered by CMD reveal that SPN is largely funded by global corporations -- such as Reynolds American, Altria, Microsoft, AT&T, Verizon, GlaxoSmithKline, Kraft Foods, Express Scripts, Comcast, Time Warner, and the Koch- and Tea Party-connected DCI Group lobbying and PR firm -- that stand to benefit from SPN's agenda, as well as out-of-state special interests like the billionaire Koch brothers, the Waltons, the Bradley Foundation, the Roe Foundation of SPN's founder, and the Coors family -- who are underwriting an extreme legislative agenda that undermines the rights of Americans. Corporations like Facebook and the for-profit online education company K12 Inc., as well as the e-cigarette company NJOY (a new member of the American Legislative Exchange Council (ALEC)), also fund SPN, as demonstrated by its most recent annual meeting. The revenue of SPN itself (separate from its member groups) increased by over 20 times from 2001 to 2012 (from $391,496 in 2001 to $8,050,050 in 2012). While, in 2007, the approximately $40 million in combined revenues of the 52 member think tanks in 45 states that were then members was less than the Heritage Foundation's budget that year of $50 million, SPN president Tracie Sharp announced in late 2007 a plan to expand think-tank revenues by $50 million by 2012. In 2010, combined revenues of SPN itself and its (then) 59 member state think tanks was $76.1 million, according to a review of the groups' IRS forms 990 by CMD. See 2010 below for more. SPN has grown into a multi-million dollar "think tank" empire, as SPN and its member think tanks cumulatively reported over $83.2 million in revenue and $78.9 million in expenses in 2011. SPN itself saw an increase in revenue of more than $3 million from 2011 to 2012. For more, including where all that money is coming from, please see SPN Funding for more. Each fiscal year, SPN distributes grants to fund research, debate series, various types of "education", and general operating costs to non-profits. The majority of these grantees are SPN members. For an updated list of SPN contributions, please see Contributions of the State Policy Network. 1999 Sep 23 This is a package of requests for donations sent to Roy Marden at Philip Morris by the larger lobbying think-tanks of the Republican right, They are all asking for money in 2000 in return for their support of the tobacco industry. SPN's founding executive director, Byron S. Lamm, was also extremely influential in the development of the organization, as well as co-founding SPN member state think tank the Indiana Policy Review Foundation. Current executive director (as of 2012) Tracie Sharp has also been quite influential. During her tenure, SPN has continued to grow at a rapid rate, expanding from 43 member state think tanks in 2002 to 59 member state think tanks in 2012. Sharp also co-founded member state think tank the Cascade Policy Institute. Please see SPN Founders, History, and Staff for more. SPN Spin on WI John Doe, People United for Privacy, November 27, 2016. ↑ State Policy Network, SPN News May 2006, organizational newsletter, May 8, 2006. ↑ 2.0 2.1 State Policy Network, SPN News Fall 2002, organizational newsletter, Fall 2002. ↑ State Policy Network, Unified Registration Statement (URS) for Charitable Organizations (v. 3.02), official organizational filing, 2006, obtained from the New York State Office of the Attorney General on October 1, 2012. ↑ 4.0 4.1 4.2 4.3 Kyle Peterson, The Spoils of the Republican State Conquest, Wall Street Journal, December 9, 2016, archived by CMD here. ↑ State Policy Network, SPN News, organizational newsletter, August 2005. ↑ Ed Pilkington, Revealed: Secret rightwing strategy to discredit teacher strikes, The Guardian, April 12, 2018. ↑ 12.0 12.1 Mary Bottari, Center for Media and Democracy, Bradley Foundation Bankrolls Attacks on Unions, PRWatch, May 8, 2017. ↑ Shareese Harold, "State Home to Think Tank with Conservative Bent" (sub. req'd. ), Arkansas Democrat-Gazette, July 24, 1995. ↑ Mary Bottari, Bradley Foundation Funnels Millions to State Policy Network Groups, ExposedbyCMD, September 5, 2017. ↑ Center for Media and Democracy, SPN Funding, SourceWatch.org, updated November 2013. ↑ Center for Media and Democracy, SPN Funding, SourceWatch, updated November 2013. ↑ FET UPDATE 940128 BUSINESS AND INDUSTRY / RESEARCH AND PUBLIC POLICY ORGANIZATIONS, Philip Morris Records, Tobacco Document Archives, January 28, 1994. ↑ THIRD PARTY MESSAGE DEVELOPMENT CONTACT LIST, Philip Morris Records, Tobacco Document Archives, October 1998. ↑ PUBLIC POLICY REVIEW COMMITTEE MEETING Philip Morris Records, Tobacco Document Archives, September 23, 1999. ↑ 24.0 24.1 24.2 State Policy Network, Background, organizational website, accessed September 2012. ↑ State Policy Network, [on file at CMD 2017 Form 990], annual organizational IRS filing, October 17, 2018. ↑ State Policy Network, [on file at CMD 2016 Form 990], annual organizational IRS filing, October 11, 2017. ↑ State Policy Network, 2015 Form 990, annual organizational IRS filing, September 8, 2016. ↑ State Policy Network, 2014 Form 990, annual organizational IRS filing, September 15, 2015. ↑ State Policy Network, 2013 Form 990, annual organizational IRS filing, May 12, 2014. ↑ State Policy Network, Staff, organizational website, accessed February 2019. ↑ State Policy Network, About, State Policy Network, 2019. ↑ 33.0 33.1 State Policy Network, Form 990, organizational IRS filing, 1997, available from Guidestar.org, accessed September 2012. ↑ John J. Miller, Safeguarding a Conservative Donor's Intent: The Roe Foundation at 39, Foundation Watch, Capital Research Center publication, May 2007, accessed September 2012. ↑ State Policy Network, Form 990, organizational IRS filing, 1998, available from Guidestar.org, accessed September 2012.